Similarly beautiful is the debut full-length from Yorkshire-based guitarist Dean McPhee. A record of quite astounding clarity and restraint, Son Of The Black Peace comprises little more than Mcphee's elegant, cyclical melodies and subtle, almost imperceptible embellishments of tremolo, reverb and delay. The results? Nothing less than gut-wrenching, as every string bend and pause is imbued with an almost unbearable level of pathos. And while Mcphee's playing feels steeped in a trans-Atlantic folk tradition, it's difficult to find any real precedents for the tone he imparts upon his work (certainly, he eschews any obvious Takoma school influences), leaving nothing more than four extended tracks of rare purity. Seriously wonderful stuff. 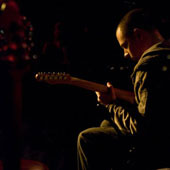 rown Bear consists of three songs of varying lengths, all of which were at least partially improvised and recorded in just one take. I am not much of a process fetishist, so that did not strike me as especially impressive in and of itself. However, McPhee’s nail-it-in-one-take artistic purity is probably responsible for much of the EP’s endearingly loose and spontaneous feel, so I appreciated it nonetheless. The brief and mournful “Sky Burial” opens the record with gentle minor arpeggios, insistent bass notes, and a clear, clean melody, which McPhee deftly twists and dances around. The following piece takes a more minimal and static approach, but McPhee employs his arsenal of old analog effects for some unusual colors and textures. While not as lean and focused as its predecessor, it is instead packed full of captivatingly baroque passages and inventive harmonies. The piece has a bit a hallucinatory feel as well, as it quavers and glistens with heavy chorusing and expertly utilizes delay to give the central melody a ghostly after-image. The entire second side of the record is taken up by the lengthy title track, which I initially found to be deceptively underwhelming. In fact, its first half could easily be mistaken for a variation of “Sky Burial” with the addition of a chorus pedal. Though certainly enjoyable, it caused me to wonder if McPhee had exhausted his ideas after just two songs. Thankfully, however, my pessimism was premature and ill-founded, as “Brown Bear” soon transforms into an extremely cool and completely unexpected foray into elegantly warped psychedelia. The bass line from the opening motif remains in a slowed-down form, which keeps things coherent, but a hazily repeating, thickly harmonized loop suddenly begins to lag, squirm, and lurk ominously beneath its melody. Eventually, all of the more straightforward elements of the piece fall away entirely and leave only a sublimely spacey ambient coda. It's quite a neat trick and Dean manages it quite seamlessly, resulting in the record's clear highlight. Solo guitar albums are not generally my favorite thing due to their inherent limitations, but I enjoy Brown Bear quite a bit. This is a very promising and assured first release, as McPhee displays a rare combination of technical skill, simplicity, and subtle unpredictability. A full-length is due next spring. Arguably the best solo guitar record in the past few years. 10/10 "
It’s odd how some reviews tend to revolve around a single idea, or perhaps a single word. 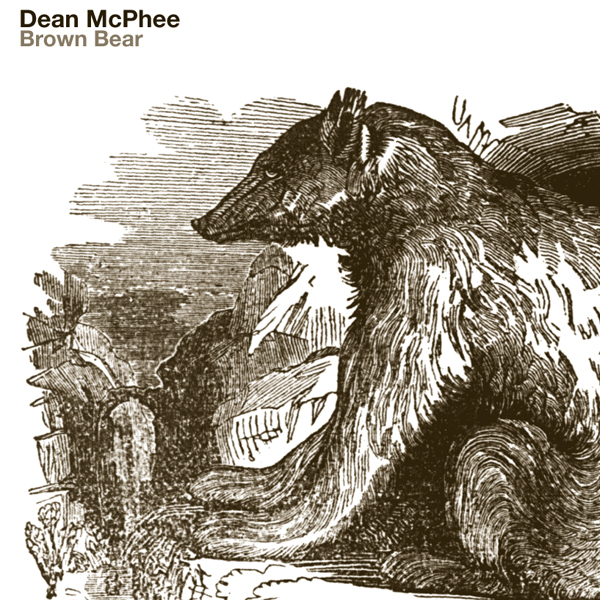 With this new 12” from Dean McPhee (his second release, the first being a split 7” with Chapters released earlier this year), the word I keep returning to is unadorned. The music on ‘Brown Bear’ is in essence simple and elemental - built from a single electric guitar and what sounds like a couple of delay pedals. Each of the 3 tracks, recorded live in one take, are full of an extraordinary sense of space and light; and at times this sounds so natural, and so fluid, as to be of the very earth. It might seem a strange tactic to hone in on what isn’t present in a piece of music, but with single guitar composition the tendency seems to be towards extravagance, each bar filled with flourishes and flurries of notes. McPhee’s style is far removed from this, instead the weight and mood is provided by the space between the notes. Not to say that this is necessarily minimalistic, more that McPhee seems conscious about what to leave out as much as what to include. As such, the tracks seem to unfold before and around you, the progressions and tonal shifts like shimmering pathways. The figures in the background here aren’t the usual – this has little, if anything to do with Fahey and Robbie Basho. Indeed it’s a struggle to put your finger on exactly who the influences are. There are elements of Loren Connors for sure, some post-rock figures from Vini Reilly to 1 Mile North; but the record I keep coming back to for comparisons – and this is probably in terms of poise and impact as much as anything – is Ry Cooder’s soundtrack for Paris, Texas, another record with a sense of dynamics and an immaculate sense of itself.